Part I. Introduction: Introduction; 1. Existentialism and its legacy Steven Crowell; Part II. Existentialism in Historical Perspective: 2. Existentialism as a philosophical movement David E. Cooper; 3. Existentialism as a cultural movement William McBride; Part III. Major Existentialist Philosophers: 4. Kierkegaard's single individual and the point of indirect communication Alastair Hannay; 5. 'What a monster then is man': Pascal and Kierkegaard on being a contradictory self and what to do about it Hubert L. Dreyfus; 6. Nietzsche: after the death of God Richard Schacht; 7. Nietzsche: selfhood, creativity, and philosophy Lawrence J. Hatab; 8. Heidegger: the existential analytic of Dasein William Blattner; 9. The antinomy of being: Heidegger's critique of humanism Karsten Harries; 10. Sartre's existentialism and the nature of consciousness Steven Crowell; 11. 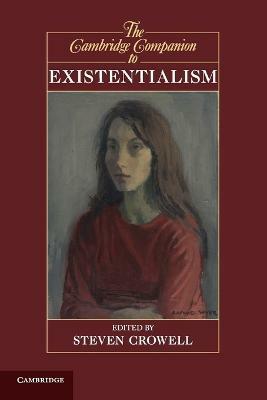 Political existentialism: the career of Sartre's political thought Thomas R. Flynn; 12. Simone de Beauvoir's existentialism: freedom and ambiguity in the human world Kristana Arp; 13. Merleau-Ponty on body, flesh, and visibility Taylor Carman; Part IV. The Reach of Existential Philosophy: 14. Existentialism as literature Jeff Malpas; 15. Existentialism and religion Merold Westphal; 16. Racism is a system: how existentialism became dialectical in Fanon and Sartre Robert Bernasconi; 17. Existential phenomenology, psychiatric illness, and the death of possibilities Matthew Ratcliffe and Matthew Broome; Bibliography of works cited; Index. 'This volume will be most useful to students for the overview chapters, and for the substantial amount of discussion of Sartre's ideas and political activities.' Michel Petheram, Reference Reviews "This is another excellent addition to the Cambridge Companion series.... Crowell offers clear parameters to provide those beginning their exploration into existentialism with firm ground from which to proceed.... serves well as an introduction to the ideas of various authors and the philosophical positions taken with respect to them.... it will be valuable for readers seeking greater understanding of a movement that has had a profound impact on both the philosophical tradition and on the wider world of which it is a part.... Recommended..."
Steven Crowell is Joseph and Joanna Nazro Mullen Professor of Philosophy and Chair of the Philosophy Department at Rice University. He is the author of Husserl, Heidegger, and the Space of Meaning (2001) and the editor of The Prism of the Self: Philosophical Essays in Honor of Maurice Natanson (1995) and, with Jeff Malpas, of Transcendental Heidegger (2001). He currently edits the journal Husserl Studies.